Anyone hoping Arsenal would be able to maintain its recent string of success in its match against Bayern Munich found themselves sorely mistaken. The German juggernaut came out against Arsenal at the Allianz Arena with all guns blazing and ran circles around the English club. Arsenal‘s back line looked like an anthropomorphic log of Swiss cheese as they watched pass after pass cut holes through the box. 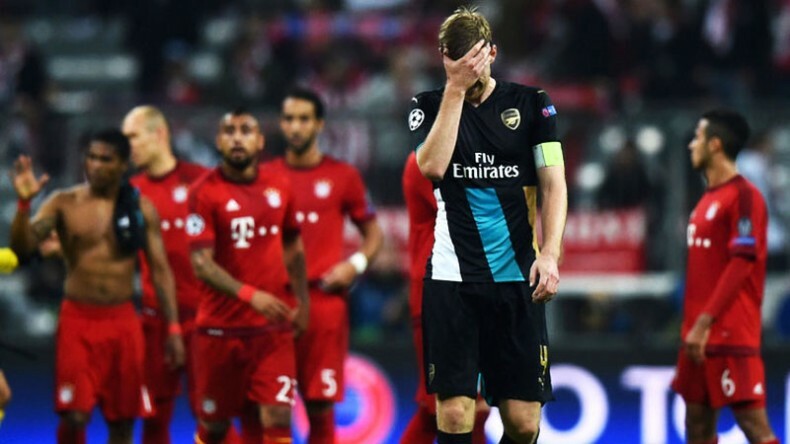 Bayern had 23 shots with 13 of them on goal compared to Arsenal‘s paltry seven shots with a measly two on target. This was pretty much what the whole day was like for Arsenal: they couldn’t score, they couldn’t defend, and they couldn’t keep possession. Bayern controlled the ball for nearly 70 percent of the game and never even gave the Gunners a chance to respond to the onslaught from the reigning champions. In all fairness to Arsenal, the team has been gutted by injuries this season and went into the match missing Danny Welbeck, Aaron Ramsey, Jack Wilshere, Laurent Koscielny, Theo Walcott and Alex Oxlade-Chamberlain. That’s six starting caliber players out of action, which significantly diminishes the squad’s depth. During their last meeting, Arsenal was able to walk away with the win thanks to some scrappy play and two hard-earned goals at the Emirates Stadium. However, Bayern Munich was quick to shut down any questions of who the better team was by completely dominating the match from the start. Bayern now comfortably sits at the top of Group F and it looks as though any hopes Arsenal might have had of progressing have now been dashed. CNN reports that the team still has a chance to advance, but in order to do so it will need to win against both Dinamo Zagreb and Olympiakos. They’ll need to beat the latter by at least two goals, in addition to having Olympiakos lose to Bayern. It’s not necessarily impossible, but it is extremely unlikely for the beleaguered London team. Despite the rough game, goalkeeper Petr Cech still believes in the team has what it takes to advance. Arsenal has reached the knockout stage of the Champions League every year for the last 15 seasons, so an early exit would come as quite a blow to the Gunners’ expectations. The staff at Betfair have listed the odds of Arsenal advancing to the next stage at 7/2, and they have put Bayern Munich as the de facto favourites to take home the trophy (once again). If there’s one silver lining that can be taken from this situation, it’s this: without the distraction or added stress required by the Champions League, Arsenal will have more time to focus on its Premier League campaign. The team currently sits second in the Premier League and is looking at its best chances at a league title since 2004.